Technique for making naan pizzas, either on the grill or in the oven. Turn all burners on to high, close the cover and let preheat for 15 minutes. At that point, turn the primary burner to medium-high heat and the other burners to medium-low. 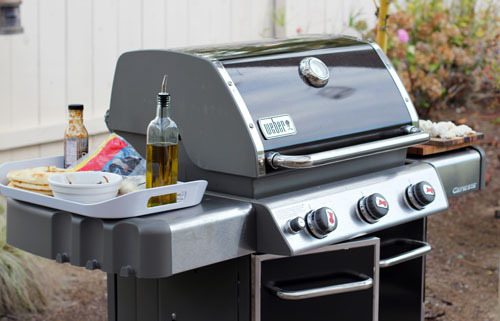 While the grill is heating up, get all of your ingredients ready to go, including any utensils you may need (spoon for spreading sauce, tongs and/or spatula, etc). Clean the grate and then oil lightly. 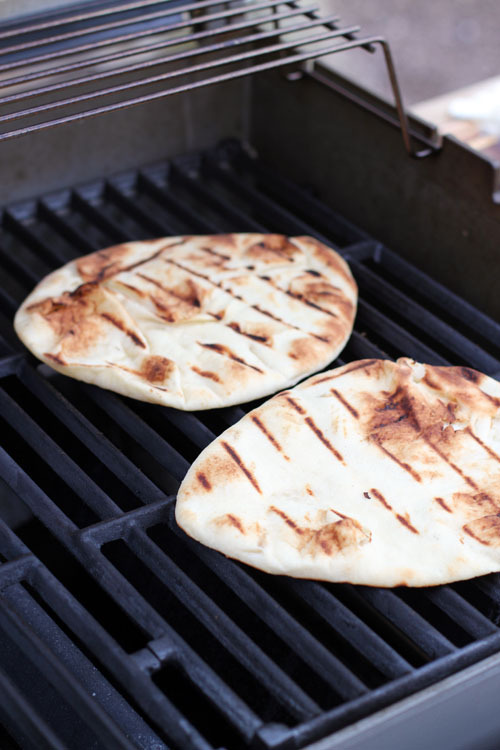 Put two naan breads on the hot side of the grill and cook on each side about 1 minute. 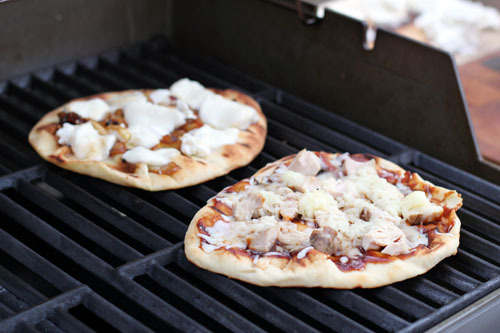 At this point you can slide the two breads to the cooler side of the grill and place the toppings on the pizza, or you can remove the naan from the grill to put the toppings on, whatever is easiest and most comfortable for you. Once bread has pizza toppings, close the lid and cook for about 5 minutes, until cheese is all melted. Remove from the grill and serve! If making more than 2 pizzas (I made 4 four our family of 5), repeat the process with 2 more naan breads. Place naan bread directly on the oven rack and cook for 2 minutes. Remove from the oven and add pizza toppings to the naan breads. Place back in the oven, either directly on the oven rack or on a piece of foil on the oven rack. Cook for 8-10 minutes or so, until cheese is totally melted. Remove from the oven and serve! I do this all the time! I actually like it better than pizza crust! I don’t know why I hadn’t thought of it before…you’re so smart! it really is pretty awesome, I was surprised how yummy it is! Leftover naan always becomes pizza here. First, though, we have to make it to the leftover stage. Your pizza looks incredible! yes, I don’t know that naan would ever survive as a leftover! I have to buy the naan FOR pizza 😉 thanks, shaina! Looks delicious! I’ve never tried it. What do you think – would this work with defrosted/baked frozen Trader Joe’s naan? Also, I can’t wait for your homemade pizza post! We never do homemade pizza, largely because we’ve only done it like once and it was just OK, not great. We love getting Nash at the Indian restaurant near us and making pizza with it. 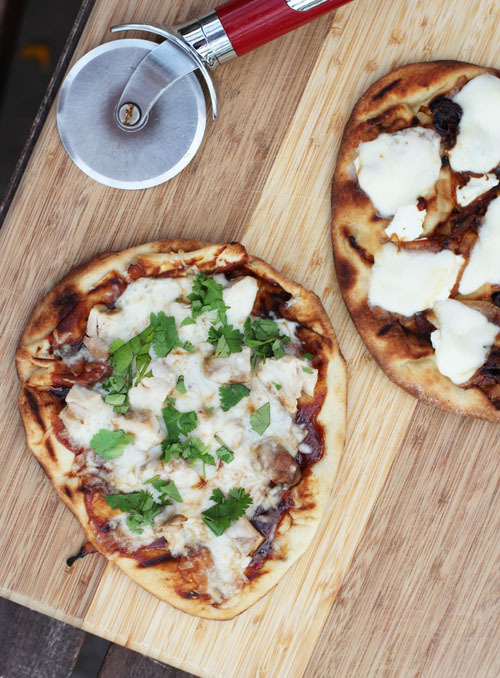 Love this pizza, especially with the naan on the grill! I’m a huge fan of naan pizzas! Try this one out: chicken, mozz cheese + goat cheese crumbles and after all is melted and the crust has a nice crunch to it drizzle a little ‘hot honey’ (couple teaspoons of honey and a couple drops of hot/Tabasco sauce) over top. So good!! that sounds AWESOME. thank you!! Wonderful! I love pizzas on the grill so much! Costco has the big pack of the smaller sized naan and I freeze them. They are wonderful to pull out of the freezer. They are the perfect size for my kids pizzas, and then my husband and I make several different flavors to share! It’s good with some nutella for dessert. great tip, I will have to stock up! You are a genius! We had these for dinner last night-they were super easy and the whole family loved them! yay!!!! so glad you tried and loved them, evaly! Just bought the mini naans from costco and was wondering about making pizza. So happy to have found this because I tried to make them before I saw your recipe and the crust wasn’t crisp. Can’t wait to try yours now. Thanks for posting! I made the mini ones last night. My husband LOVES them! I made 4 and I had to make 4 more. So happy to be able to make Naan pizza! 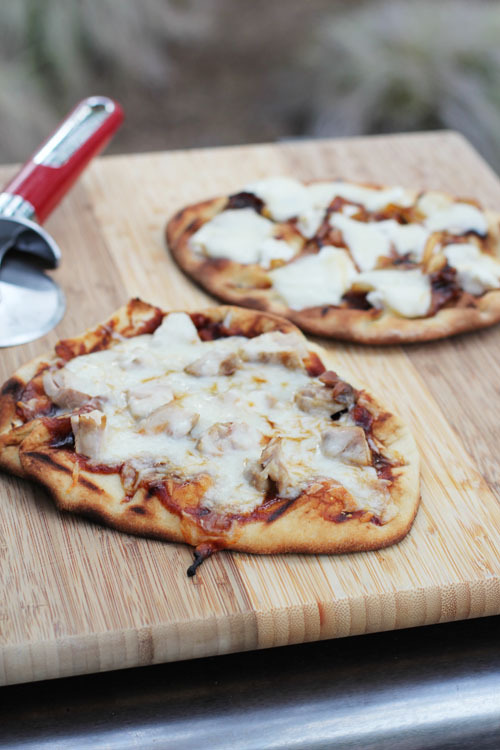 so glad it was a success – I really do think naan pizzas is one of my favorite dinner discoveries, so easy but so yummy! hi patty! fun idea! yes, I could see that it would take much longer for the cheese to melt on an open fire, with a home grill the enclosed heat with the lid closed helps things cook much faster! I imagine you could maybe even skip the step of grilling the naan on both sides before adding toppings, to account for the fact that it will be on the grill longer. I’m so glad you commented – hadn’t thought about doing this camping! 🙂 thank you!